Luxury chocolates made in Scotland. The ulimate chocolate for ginger lovers. Crystallised ginger pieces and fine ground ginger are.. Box of 8.Luxury dark Belgian chocolate encases succulent fruit pieces in rich chocolate centres.Bram.. 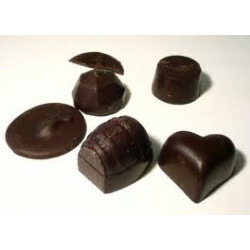 Dark Belgian chocolate encases rich chocolate centres generously laced with single malt whisky. Dist..